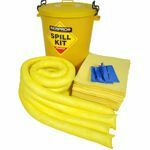 Serpro spill clean up kit for oil and chemical spills for emergency cleanup. 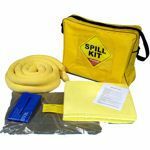 Spill Kits provide immediate response to oil and chemical spills and SERPRO offers a variety of types for any emergency application. 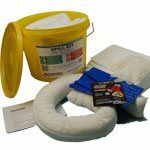 - General Purpose Spill Response Kits are our most versatile spill kits for clean up of coolants, oils, solvents and water, found in many industrial workplaces. 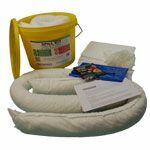 - Our oil spill kits specifically made for spill response to applications that require only oil to be absorbed and not water. - For acids and bases and other hazardous aggressive liquids, Chemical Spill Kits, also known as Hazmat, should be used. 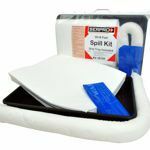 Spill kits are available in a variety of configurations that include bagged, wall mounted carts, spill trucks, overpacks and many more. 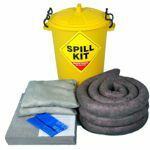 Truck Spill Kits are also very popular among freight transporters for the cleanup of fuel spills. 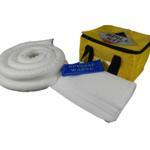 These emergency spill response kits fit in tight spaces on vehicles and equipment. All of these types of are available from SERPRO, the leading retailer of quality Spill Response products.